A reluctant hero with a tortured past, a willing mentor who knows more than he shows, and a host of fearsome adversaries come together in “Legacy of the Bear.” Set during Scandinavia’s Viking Age,this is the story of Autar Magnusson’s entrance into manhood. 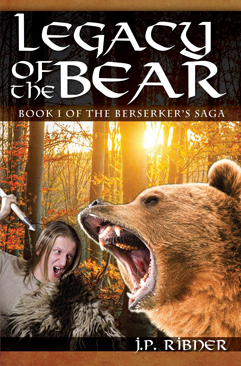 Once labeled a coward by his father, Autar is nonetheless determined to risk his very life against a ferocious and legendary bear to prove himself worthy of becoming a berserker. Join Autar on an adventure filled with violence, bloodshed and revelation as he seeks to inherit… the legacy of the bear. To be quite honest, I am not generally a fan of the fantasy genre. This book made me change my mind.